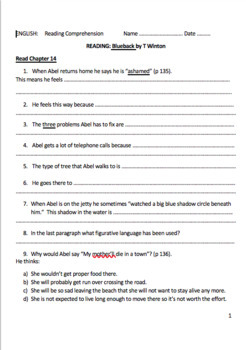 This teacher guide provides activities for each chapter as well as three comprehension questions per chapter. The three questions focus on Retrieval, Inference and Authors Choice. My class calls them RIC questions. 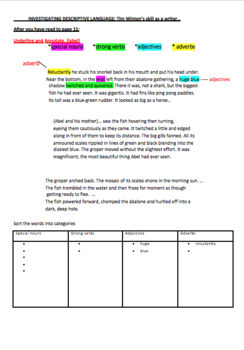 This fantastic teacher guide also comes with additional resources including a comprehension test at the end of the novel. 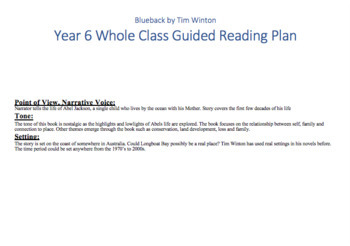 My year 6 class loved reading Blueback and the study that went along with this novel. This guide is completely editable to change or adapt any of the suggested activities to fit your classroom. We read the entire book over the course of one term.